June 17th was our 6 year Anniversary! I know, I know, it was also Father's Day...I am still a little bitter that Father's Day tried taking over "MY HOLIDAY". But I guess if I had to share my day with some other special occasion then I am glad it was Father's Day. I would have absolutely hated sharing my anniversary with a day like Mother's Day, because I am sure my sneaky husband would have tried to combine my gifts into just one lol JK ;) Anyways, it was a wonderful anniversary and my amazing hubby did sweet little things to make the whole week special! On Wednesday my hubby surprised me with the mot beautiful flowers. I absolutely love receiving flowers and John had the florist put together the most gorgeous sunflower & wild flower bouquet. John knows that I love large arrangements so he made sure that this bouquet was over the top! Friday was a wonderful day as well. Some of our very best friends (the Martinez family) came to town for a visit. John took off work Friday so we could spend some quality time with them. We had so much fun going to breakfast, visiting the Dallas Aquarium, hanging out at the pool & just relaxing. Friends & family are two of life's greatest blessings & I am so thankful that I have not only an amazing family but dear friends who are just like family! Sunday June 17th was our actual anniversary & it was a great day. John was so excited about his Anniversary/Fathers Day gift (a Weber Grill) that he cancelled our Sunday lunch reservation & instead he BBQ'd steaks & shrimp on his new grill! John was not the only one who got spoiled though...even though I told John NOT to buy me anything since we will be celebrating our 6 year anniversary with a cruise to Mexico in August (we wanted to wait until Josselyn was at least 1 year old before we left her for a week). John did not listen (which now I am kinda glad lol) & he surprised me with a gorgeous amethyst DY bracelet. John picked it out all by himself & I absolutely love love love it! John and I had a wonderful 6 year anniversary & I can not wait to enjoy many more anniversaries in our future. I feel so blessed to be married to not only my best friends but the love of my life. When I think back at the past 10 years we have been together (6 of them we have been married for) I can not help but think of the incredible journey we have been on. We have definitely had our share of both up's & down's. We have experienced loss, grief, heartache & disappointment as well as joy, blessings, new life & fresh beginnings. I honestly can not imagine walking through life without John by my side. He has been such an amazing strength & support to both my family & I. I thank the Lord every day for blessing me with such a loving, Godly husband. I truly believe that I married the exact person that God created for me. Writing about this reminds me of the beautiful song "When God Made You" that my dad walked me down the aisle to on my wedding day. The chorus of that songs says, "I wonder what God was thinking, when He created you. I wonder if He knew everything I would need, when He made all my dreams come true. When God made you, He must've been thinking about me." Those words are exactly I feel. I never dreamed or imagined that I would marry someone as incredible as John. The Lord gave me everyone of my heart's desires & more! I am so lucky to have found my soul mate! Since this Blog turned out a little mushy I decided to just go ahead and make it even mushier! 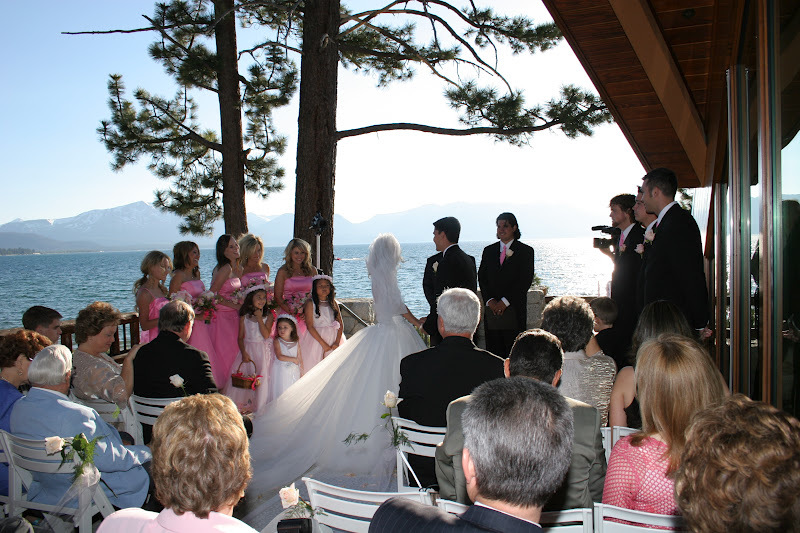 I know that most of you were not there with us on June 17th 2006 in South Lake Tahoe as we exchanged vows, so I decided to post a little clip from that special day. I must admit watching the video below definitely brought back a flood of unexpected memories. Our wedding is a day that I will always cherish & hold dear to my heart for so many reason. 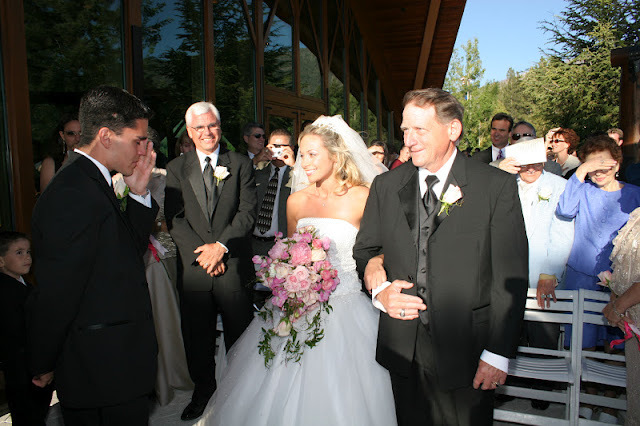 June 17th 2006 was the day that I married the man of my dreams, it was the last day my whole family spent together, & it was one of the very last times I saw my father. I am so thankful for all of those things & I can definitely say that June 17th was one of the BEST DAYS of my life. I hope you enjoy this little glimpse inside our wedding day.